Our recreational students come to the studio once a week for between 35-75 minutes. Students may take multiple classes. View our complete listing of currently available classes. Class consists of ballet with emphasis on ballet vocabulary, flexibility and strengthening exercises. Introduction of more tap technique and memorization. Students will develop an appreciation of dance in a non-competitive environment while building self-esteem. This class is open to ages 7-up. This class focuses on mastering more basic tap fundamentals and increasing speed. Jazz technique is introduced with basic jazz steps and combinations. Classroom is more disciplined, yet still non-competitive and fun! This class is open to ages 7-12. Our pre-competition program starts at age 5 and is by teacher recommendation only. 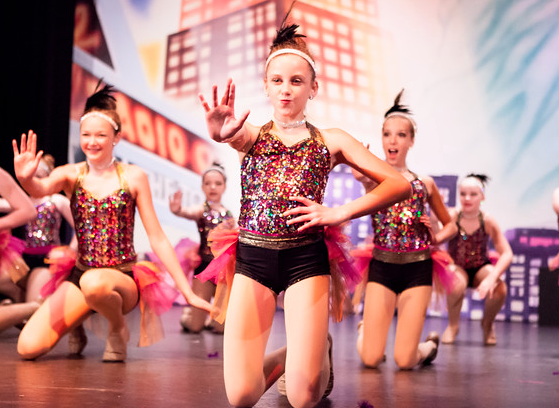 Classes teach jazz and tap, and are designed for the student who is looking for more of a challenge, and/or planning to audition for one of our competition groups in the future. These classes will focus on the technique and stage presence needed to compete, and will participate in one competition in the spring. Our beginning acting skills class will teach students the fundamentals of acting, reading scripts, improv, and much more! This class will perform in our Holiday and spring recitals! Sign up for this class monthly, or drop in for $15/class. Students will learn basic choreography and acting technique as they prepare a medley of popular musical numbers. Working as an ensemble, this class builds the essential musical theater skills for emerging Broadway stars! Students will learn popular cheers, stunts, tumbling, and mini-routines in this fun new class!